The life expectancy of a nitrogen gas spring begins with the manufacturer. Choose a gas-spring manufacturer whose representatives can offer assistance with design and provide custom nitrogen systems based on the application. Also ask your supplier for product-performance guidelines, including recommended charging pressure, operating temperature and speed, all of which influence gas-spring life expectancy. Metalformers should think about adding nitrogen-gas spring accessories (shown) to the die design to assist with spring operation. Consider piping gas springs together to provide the ability to monitor, control and adjust force from outside the die. 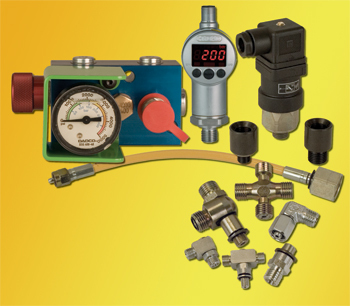 Many gas-spring manufacturers offer a wide selection of hoses, fittings, control panels and other equipment to simplify piping operations. die and picking the appropriate mounting method. Once the choice has been made, be sure to follow the manufacturers’ guidance to ensure optimal performance. Die design plays a critical role in optimizing nitrogen-gas spring life. The recommendations provided here can apply to new die designs as well as to retrofits of existing dies. Nitrogen gas springs have standard operating specifications. A typical gas spring may be charged to a maximum pressure of 2175 psi (150 bar) with operating temperatures as high as 160 F. It is imperative that gas springs do not exceed maximum charging and operating-temperature guidelines. Whenever possible, the actual rod travel of the gas spring should not exceed 90 percent of the gas-spring stroke. This provides a safety factor to avoid die or gas spring damage, and serves as a basic rule for good performance. Selecting a rod travel of only 75 to 80 percent helps reduce the pressure rise in the cylinder and the amount of heat produced, improving the spring’s overall performance. Although overheating will not necessarily cause immediate damage, after prolonged operation it will damage the seals and lead to premature spring failure. During the design stage, process conditions that may reduce spring life can be offset by reducing percent-travel and pressure, and by adding surge-tank volume to a linked system. Manufacturers also offer special cylinder types designed for lower pressure-rise factors and higher production rates. Further, designers should aim to distribute loads evenly among the springs so that none of the springs must work to full capacity. This allows the springs to run cooler and maximizes their life expectancy. Some springs have been designed to be recharged, but not rebuilt. Check with the manufacturer prior to repair to verify repairability and to obtain the appropriate instructions and repair kit. In some cases, standard bench tools can be used to repair gas springs. However, using the recommended load cells, removal and installation tools, and filling equipment is highly suggested. maintain a lower pressure rise. Metalformers also can install electronic pressure monitors to a setup, to examine system pressure from outside the die. Transmitting pressure readings, they can either signal the press controller or directly shut down the press prior to production problems. Als use the top of the piston rod as the strike surface, never the bottom of the spring. By designing dies with the proper guide conditions (adding guide retainer sets, roller bearings and wear plates), and using a hardened strike surface, the metalformer helps to ensure long spring life. Improper or inadequate guidance within the die can lead to side loading, which occurs as a result of axial or contact misalignment. This can cause damage to the bearing, seal and piston rod, significantly decreasing spring performance. A standard recommendation is to maintain less than 1 deg. of side load on the piston rod. Contamination within a die may cause premature spring failure. Die designers should specify drainage holes within the spring pockets to prevent fluid from pooling around the springs. During production, protect gas springs from direct exposure to caustic draw-die compounds and contaminants. Where this is unavoidable, the metalformer should contact the spring manufacturer to discuss possible protective measures for the gas springs. There are two popular alternatives used in the field to minimize the ingestion of fluid. One option is to add a protective cover to the gas-spring rod to prevent exposure; the second is to install a secondary heavy-duty wiper to clear a the caustic fluids from the rod. Contrary to popular belief, maintenance of nitrogen gas springs does not begin when the spring has run its course through the production cycle. Maintenance begins by recognizing the different factors that influence the performance and life of a gas spring. Much of what affects the performance can be controlled prior to experiencing any problems, such as safe design and diligent preventive maintenance. Sound preventive maintenance procedures require operators to periodically check the pressure and physical condition of springs for signs of wear. If a sampling of springs exhibits unsatisfactory appearance or pressure, the operator should check the remaining springs in the die. Changes in spring pressure and condition can indicate potential problems in die design, build or operation. When checking gas-spring pressure, compare the current reading to the original pressure listed on the die tag outside the die. If the pressure appears low, examine the spring for leaks. Apply fluid around the top of the cartridge assembly, around the piston rod and, in some cases, at the port. If no leaks are found, recharge the spring to the desired pressure and retest for leaks. To check the physical condition of the spring, begin by visually examining the piston rod and tube assembly—this can be done without dismantling the spring. Worn springs should be evaluated and, if in good condition, rebuilt. Look closely at the rod finish to anticipate any problems with the spring, since the majority of springs manufactured today seal on the piston rod. Upon examination, if the rod is damaged it will need to be replaced. When handling damaged springs, use extreme caution and do not attempt to repair them, under any circumstances. Badly damaged springs should be safely disposed of, after relieving any remaining pressure. When a spring has failed but generally remains in good condition, a metalformer has a couple of rebuild options: rebuild inhouse or send the spring back to the manufacturer for repair. Maintaining and repairing nitrogen gas springs is relatively quick, easy and cost-effective. Some springs have been designed to be recharged, but not rebuilt. Check with the manufacturer prior to repair to verify reparability and to obtain the appropriate instructions and repair kit. Repair procedure varies between manufacturers and spring models; therefore, maintenance technicians need specific instructions for each model. 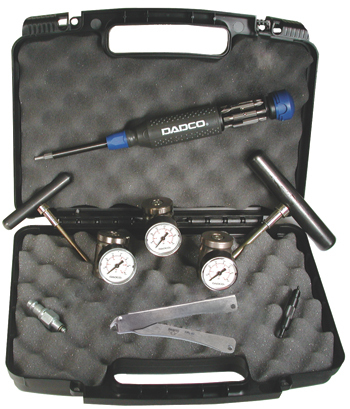 In some cases, standard bench tools can be used to repair gas springs. However, using the recommended load cells, removal and installation tools, and filling equipment is highly suggested. The repair technician should have a solid understanding of how to perform maintenance and repair on the springs. Nitrogen gas springs are charged to a high pressure, so the maintenance technician must closely follow all safety precautions as outlined by the spring manufacturer, and maintain a clean working environment to avoid any contamination. Some manufacturers offer training courses on gas spring repair, which is a great to encourage your employees to follow the proper procedures. Article provided by Dadco: 734/207-1100; www.dadco.net.